The Stock Report lets you review, print or export details of your stock. Filter by a combination of Medium, Category, Artist and other values. You can also specify that reports only include those artworks marked as consigned into Tessera. 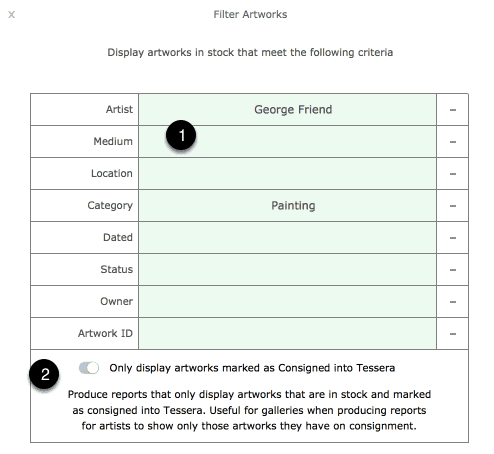 This allows you to produce reports for specified artists detailing artworks they have consigned into Tessera. Leave this screen and return to the artwork component where all artworks currently shown in the filter will be displayed. Export the filtered result to a spreadsheet. 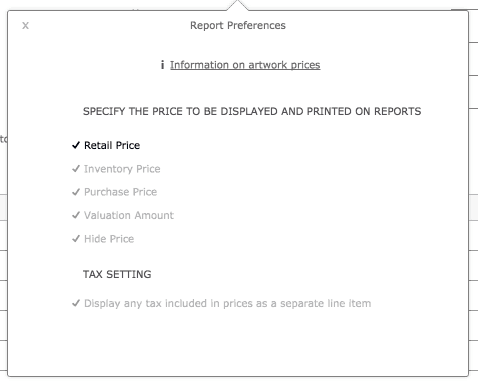 Use Report Preferences to specify what pricing details should appear on the report. Use today’s date for the current stock level. Use SELECT INVENTORY DATE… to specify a date in the past. It may take some time to recalculate the stock levels for an historical date. Edit the price to be displayed on the report. This can also be edited using Report Preferences. This artwork has one or more artworks out on consignment. Click on the icon for more details. These artworks are marked as having been consigned into Tessera. Use these menuas to select which items will be displayed in the report. Here the only artwork selected to be displayed are those by George Friend that belong to the category of Painting. There will be times when you only want to include artworks consigned into Tessera. 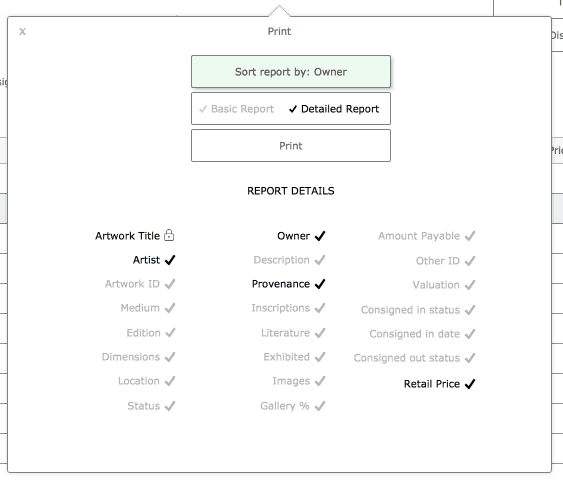 This allows you to produce a report for an artist or owner that displays the artworks they have consigned to you. Control the amount of detail and the format of the printed report. 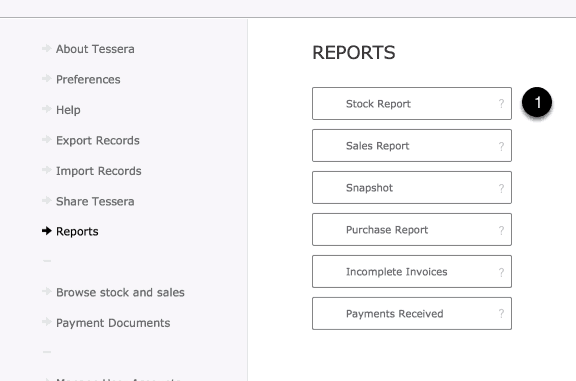 Control the amount of pricing detail to be included on the final printed report. Includes the options to hide all pricing which is useful as it allows you to provide to an artist a record of all the stock you hold of their work without revealing your pricing choices.